Photoshop is a new love and hobby of mine. I now have just about four months of expertise with the software under my belt. You can find most of my work here, and while you’re at it become a fan of my Facebook page and hit the “like” button. The ability to manipulate and or enhance pictures to my liking is a great way to express myself creatively. Working with a mouse was not a problem for me, but a colleague I met on Facebook, Quincy Armstrong, recommended going with a tablet. He stated that since he got one he has not looked back since. Still skeptical I read some reviews and bought one for my birthday to try out. The tablet most used by Photoshop professionals is the Intous 4 from Wacom. Since purchasing this wonder using Photoshop has become a different animal completely. The Intous 4 comes in 4 sizes, small, medium, large, and extra large. The small was big enough for me and met my budget guidelines. The small measures the tablet area at 3.875” x 6.3’ and the whole unit at 8.2” x 12.2“ and weighs about 2lbs. Plenty of space for working with any screen and small enough to carry around with laptops as small as a 13” Macbook. 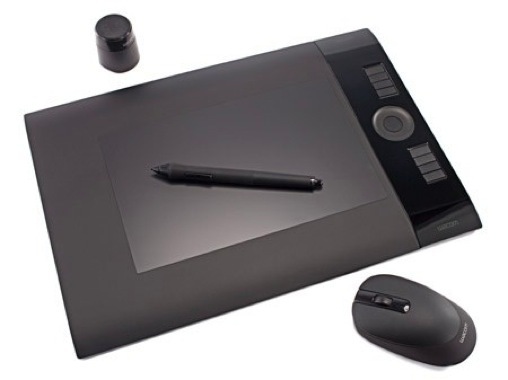 The tablet also comes with a mouse, Pen and holder with additional nibs, and a USB connectivity cable. Upon opening the box reveals a sleek, black thin tablet, pen and holder. After installing the software, the very first thing I noticed about using this tablet is the way the pen felt on the tablet surface. I was expecting the pen to feel very slick on the tablet however the tablet feels like a piece of paper, making pen to tablet contact very natural. The pen is pressure sensitive so imprint will be dependant on how hard or soft you push down on the tablet. The sensitivity is a big deal and makes the pen feel more like a pen or pencil. If you are using CS5 the brushes even angle identically to how one is holding their pen. On the left side of the tablet, or right side for lefties (yes lefties this unit is compatible for you also) are the scroll ring and express keys. The scroll ring can be programmed for any function the user prefers and feels similar to an old school iPod dial with a center button for selection. The presets are primarily for scrolling and zooming, but the user can change these settings to anything they choose. The benefit of this is the user can use one hand to make adjustments while you are still drawing with your pen hand. There are 8 express keys present, 4 above the scroll ring and 4 below the scroll ring. These keys can also be programmed for functions such as Alt, Shift, Command, pan/scroll, and precision mode. Precision mode slows down sensitivity with the pen allowing a lot less movement on the screen. This is key for when precision detail is required. The Pen itself also has two buttons on it that are programmable. I have found that this is ideal for when you need to bring up your brush menu and change. Included with the pen is a holder that contains different nibs or “pen ends” depending on the desired effect you would like with your project. Just a quick twist will change your Nib. I’m very surprised by and satisfied with my investment. The tablet makes the use of Photoshop so much easier and I would never go back to using a mouse alone. If you are an avid user of Photoshop I highly recommend getting one of these Intuos 4 tablets. The Intuos 4 small retails for 199.99. Attached below is a link to the site. thanks for a great review of the intuos tablet. i'm thinking about getting one myself but i'm not sure whether the small one isn't too small. i'm planing to use it for very light amateurish illustration work and to be honest can't afford anything larger. what is your opinion on the size after few weeks of use? Sorry for the late reply. I love it. It makes using photoshop or any type of editing software that much easier. Wacom Intuos makes a huge difference in precision and options.